The Texas Rig is a technique used for fisihing soft plastic lures. It involves a bullet weight being threaded onto the line first followed by an optional glass or plastic bead, and then the line is secured to a hook, usually an offset worm hook. Very good for bass fishing. The hook is then inserted into the head region of the worm and exits the worm about 1/4 of an inch down the worm. The worm is then moved up the hook towards the shank and then rotated so that the worm is now ‘locked’ on the shank. The point of the hook is then thread back into the body of the worm to make the rig weedless. The bead is fully optional. Some anglers find that the added noise or color a bead can provide gives them an advantage in stained or muddied water, because the clicking imitates a crayfish crawling over rocks and debris, while some anglers think that the bead detracts from a realistic presentation considering that most worms will not click. The Texas Rig is not a search rig like a spinnerbait or a crankbait. 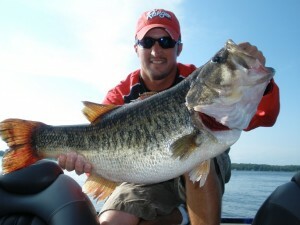 It is usually fished by throwing the soft plastic as close to cover as possible with the goal of placing the worm as close to a bass as possible. Try to let the lure enter the water with as little noise as possible and keep some controlled slack in the line as bass will commonly attack the lure while it is sinking to the bottom. If the bass does not hit on the fall, let the worm rest on the bottom for a brief period and then begin to retrieve the lure in a very slow, jerk and pause motion. Be careful to always keep a little tension on the line because learning this technique is a lot about learning to differentiate between the feel of the bottom and the feel of a fish. Lake Fork Trophy Bass © 2018.